A man in his 40s set his apartment on fire on Wednesday and stabbed residents of the building as they tried to escape the blaze, killing five people and injuring 13 others. Police said they are looking into the medical records of the man. He was apprehended at 4:50 a.m. on the second floor corridor. 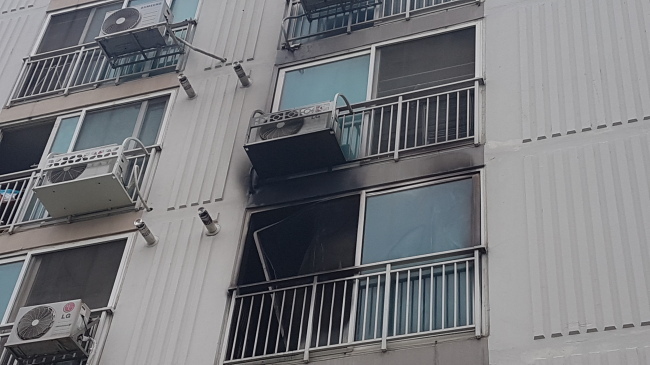 The 42-year-old, surnamed Ahn, set fire to his apartment unit in Jinju, South Gyeongsang Province, at around 4:29 a.m. Wednesday. After shouting “fire,” the perpetrator reportedly stood at the staircase on the second floor and wielded two sashimi knives at residents running down the stairs to escape the burning building. Jinju police said Anh likely chased the victims in the attack, as blood was found at the end of the corridor. Some residents of the 10-story building went up to the rooftop to avoid the attack. A female resident who witnessed the incident told a CBS radio news show on Wednesday morning that the scene was chaotic as people were running up to the rooftop while the blaze continued. According to the witness, one of the victims told her that Ahn had pushed a body to the side with his foot while attacking others. 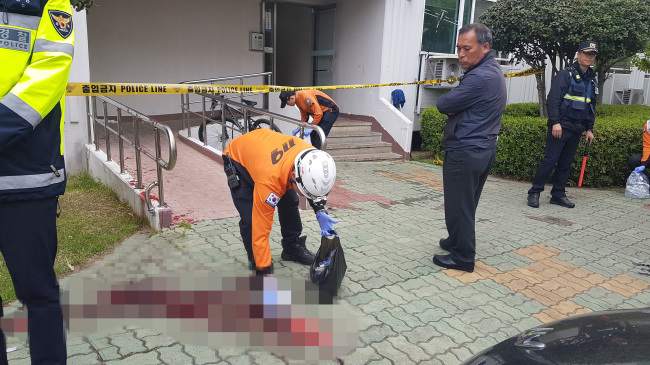 Five people, including a 12-year-old girl, a 65-year-old woman and a 74-year-old man, who were found at the stairway, corridor and entrance of the building were killed in the incident. Two people were seriously injured, while seven others have been transferred to nearby hospitals for smoke inhalation. The fire was extinguished after about 20 minutes. Police used a stun gun and fired two blank shots and a live bullet in apprehending Ahn. Ahn lived in the apartment alone and had no job, police said, adding that the motive behind the crime has not been revealed, as the man has been incoherent. Initial wire service reports cited unnamed police officials as saying the man carried out the attack in response to unpaid wages, but the Labor Ministry later released a statement saying that its records did not match the claim, and there had been no complaint about unpaid wages filed. According to local media reports, Ahn had caused several disturbances since last year. The apartment management office said he threw feces in front of his upstairs neighbor and the building’s elevator in September 2018. He threw feces and created disturbances on March 12-16 as well. One of the five people killed in the attack was an 18-year-old girl surnamed Choi. Choi’s family, who lived directly above Ahn, installed a security camera in front of their door, as Ahn had followed and threatened the girl. The neighbors and the management office reported Ahn to the police on April 2 as disturbances continued. According to the residents, media reports said, police came but left saying that they could not carry on a conversation with Ahn. Jinju Police have organized a task force led by Jinju Police Chief Lee Hee-suk to investigate the incident. Two profilers and seven investigators from Gyeongnam Provincial Police Agency have joined the team. Thirty-nine police officers from Jinju Police station were dispatched for the initial investigation, while 15 investigators from a forensics team examined the scene. Police and counselors were also sent to the scene to assist victims.